The next article up in our CES 2014 coverage will include memory and storage vendors as listed in the title. Not a tremendous amount has really changed on this front, except for some product line changes, though we did get to see a functional DDR4 server in front of our very eyes. In their system memory area, Patriot has changed the design of their Viper line heatspreaders. They are a bit shorter now to help with any clearance issues. Patriot is diversifying what they sell even more in 2014, which leads to them showing off their broad line of portable battery chargers, specifically their Fuel and Fuel active lines. One unique feature on some of these models are the 2.5A output (versus the standard of 2.1A) to help devices charge faster. Something we saw quite a lot of here is USB storage devices now containing the micro USB headers, which allow one to plug directly into their supported mobiles devices (Android 4.0 and higher for example) making for incredibly easy storage capacity for such devices. Like Patriot, Mushkin also completed a redesign on their heatspreaders too, dubbed Frostbite II with its vortex thermal design instead of their jagged protrusions on top we’re more familiar with. These will be standard on the new Blackline and Redline sometime in February. They are also bringing out new SSDs named Helix, which are PCIe based and built around the new LSI SF-3700 controller. We’ll also see Mushkin bring higher capacity mSATA and the newer mini PCIe standard SSDs to market, which is seemingly gaining traction in the market. The Scorpion II and Scorpion II Deluxe are the next generation sitting on the PCIe bus. The new drives have Optimized Durawrite (lowers write amplification), SHIELD error correction, and RAISE technology. 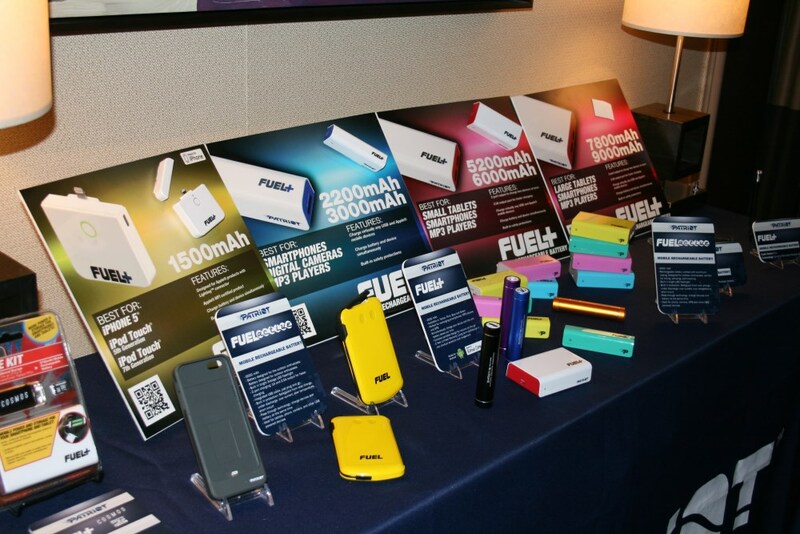 Our friends at ADATA, like a lot of companies, are trying to expand their market and are getting into things like battery chargers and other phone accessories (not pictured). They have also heard the cry of those that believe the looks of the PC (ram in this case) is just as important as performance and will bring out a couple more color options for the heatspreaders. ADATA will be bringing new SSDs and PCIe based SSDs to market that use what appears to be a popular choice, the new LSI controller. One thing to note here is the 256 GB SSD with ONE IC to make 256 GB. Densities are getting higher, so hopefully pricing continues to drop on everyone’s favorite toy while capacities continue to increase. We will now continue our memory and storage marathon with our friends at Corsair. They have already branched out their product line with things like speakers and headphones (Raptor and Vengeance lines), and here we have pictured some of their line-up. One of the more impressive things coming out of this camp is the mechanical RGB keyboard. The picture I have does not do this thing justice. You could literally do anything on this keyboard as far as setting up individual colors on keys, to how long it stayed on after pressing it too… well, just about anything. Also cool is you should be able to save the profiles to share and upload them in a community setting like their forums. This will include the Cherry MX keys as well. For cases, two things caught my eye. The Full tower Graphite series 760T with its large lightly tinted plexi and hinged side panel. Inside of that you will notice the new AX1500i power supply. This is a Titanium rated (when they come out with that standard anyway) 94% efficient PSU at 50% load. Due to its efficiency, you can run this in the USA on a standard power socket and not blow a breaker. You will also be able to monitor power use and efficiency using the bundled software. Next the Obsidian 250D mini ITX sure did catch my eye as a good looking mini ITX case. It falls in line aesthetically with the 700/800/900D series with its brushed aluminum front. Last up is their new mobile wireless drive, which combines a storage platform with a streaming source via WiFi, USB3, or Ethernet for up to five concurrent users. Neat little device this thing! At Kingston we saw some exciting things as well, especially for the future in a server running 384 GB of DDR4 (that is all we can tell you, as that is all we were told!). What they first showed us was their new Data Traveler Locker+ G3 USB3 stick in a sleek metal case. As mentioned, it is USB3 based and also comes with its own built in security to protect your files. DataTraveler Locker+ G3 is available in 8 GB, 16 GB, 32 GB, and 64 GB capacities and is backed by a five-year warranty with free live technical support. Next up is a new, faster SD card that you can use in many devices ranging from cameras to some tablets. Next up is another small storage device with both USB and micro USB headers to use with smart phones. It is a quick drive as well. The Kingston rep showed us a movie on his smartphone and could jump to different scenes with no delay. They are also coming out with a new line of SSDs, which will encompass SATA, mSATA, PCIe, and mPCIe interfaces based on the new LSI SF-3700 controller. The picture below with all the movies on one screen (50 I believe at once) is just showing the massive throughput of a slew of SSD drives being able to output that many consecutive movies. The limiting factor was the GPU in this case. You can also see a line of memory coming out dubbed “Fury” with its new heatspreaders, which come in your choice of a few colors. Also pictured are some higher speed SO-DIMMs for the small form factor systems that seem to be en vogue now. There we have the majority of the major players in ram, storage, and SSDs covered. We are looking forward to reviewing a lot of what you see here in the coming weeks as far as memory and SSDs, so keep an eye out on the front page! Have had hands on a few of these brands. Of them all Mushkin on AMD Phenom II and FX platforms was my favorite. Although currently in my gaming rig, running a couple of Patriot Viper extremes 1000mhz Cas 9-11-9-27-50 @ 1.5v. A little looser than the Mushkin 1866 Cas 9-10-9-27-36 running 1000mhz @ 1.5v no problem Either AMD or Intel platforms.